We have partnered with ChiroHealthUSA and now offer discounted medical plans to patients who are uninsured or underinsured. To learn more about ChiroHealthUSA annual membership and discounted fees, give us a call! 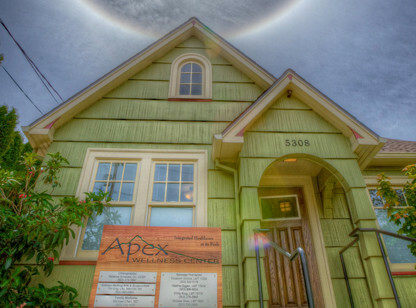 As the premier Foster-Powell neighborhood wellness center, Apex Wellness Center is dedicated to our community. Why sit it traffic when you can walk or cycle to your appointment? Apex approaches patients from a holistic point of view, integrating Chiropractic & Physical Rehabilitation, Massage Therapy, Acupuncture & Chinese Medicine and Family Medicine. Most of our patients come to us because they’re dealing with pain, have been in an auto accident, experienced a sports injury or are seeking a balanced, healthy lifestyle. We approach our patients as individuals—learning about their needs, preferences and lifestyle values, and then recommending an appropriate, conservative care plan or referral. We don’t believe in a “one size fits all treatment” and we never recommend big care plans that patients don’t need. Apex approaches patients from a holistic point of view, integrating Chiropractic & Physical Rehabilitation, Massage Therapy, Acupuncture & Chinese Medicine, and Family Medicine. Embracing eco-friendly practices is of paramount importance to Apex. We’re all about wellness and healing, and this attitude extends to our environment. We were awarded a Sustainability at Work Gold Certificate for 2012 – 2015, and a platinum Certified Backyard Habitat, an award usually given solely to residences, not businesses. But then again, Apex’s home is a wonderfully restored house with a lively garden in its backyard. Read more about our restoration process and green initiatives.